A collaborative effort between the Renaissance Society and Poem Present brought Ariana Reines onto campus for this quarter’s final installment of the Reading and Lecture series. A full crowd settled into Taft House Thursday evening, the tail end spilling out of the room’s open door and into the corridor, all quietly seated, attentively waiting, necks crooning as the 30-year-old playwright, translator, and (perhaps most nominally) poet Reines stood at a small podium at its center. The heat of the day had not yet subsided, and with sunlight pouring through the large pane windows above, the space took on a haziness and humidity that one audience member later compared to a hummum. The reading began quietly. Just prior to launching into her first poem, she suggested we interrupt if needed, and to do so vocally if she was hardly lifting her eyes from the printed work she was about to read. I found this gesture intriguing and, for no single reason in particular, felt myself open up to the environment, putting all lingering fixations on the hotness of the air and the brightness of the space to rest. As Reines began to read, unassisted by microphone and quietly at first—so much so that everybody seemed to collectively freeze in place—her words lingered on, old ones hanging loosely in the room like ghosts. I heard gasps, chuckles, and most often, most unsurprisingly, sounds of people thinking: reactions to the world Reines was rapidly constructing with her sharp imagery and seamless rhythms. Reines read selections from all three of her books of poetry: The Cow (2006), Coeur de Lion (2007), and Mercury (2012). 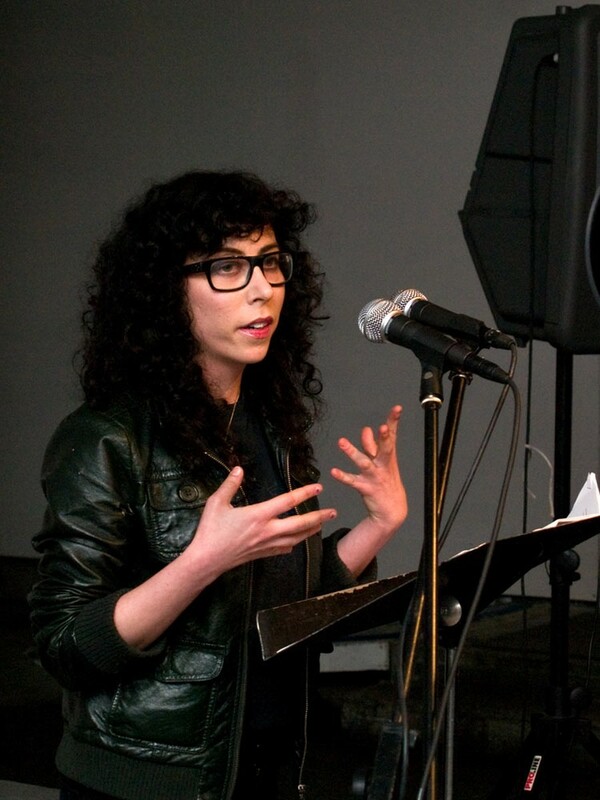 While all three publications reflect her extensive interests in the body, the ways in which corporeality can be experienced, new forms of media (with a particular emphasis on the Internet), and long-form prose, the changes occurring among these three texts, although subtle, are most apparent when hearing Reines present her poetry. The books move in a teetering but generally comprehensive expansion outward from the self. That is, Cow starts out turned inward. The five-year gap between Coeur and Mercury reveals a particular stylistic leap: The very “Internet blog” tone of Coeur, as a work that essentially deals with the author discovering her boyfriend is cheating on her by hacking into his e-mail, is necessarily colloquial. It’s unrestrained, self-contained, anxious, and unapologetic for its blatant finger-pointing at the messiness and embarrassment of everyday life, and that translates immediately over in the way that Reines read from the text in a way that sounded almost like the banter she entertained between poems. It was Coeur that threatened—or at least restructured—the trance-like vibes that Reines had quickly conjured up and enveloped the room in during her more subdued initial reading. Bound so tightly to her own experiences, lively, sharp, and ultra-personal, Coeur’s autobiographic nature manifested through the quickness and excitability of its reading. Her poetry filled the small sunlit room with a sense of magic. It’s self-contained, fluid and transcendent. The reading, punctuated by frequent banter, a missing sheet that caused the ending of a poem a page too early, was transformative all the same—not out of immaculacy but because of its embodiment, exactly for its clunking awkwardness, its weight, the gestures it leaves behind. Ariana Reines is all poetry: It’s in the way she reads just as much as what she’s reading, but it’s perhaps most evident in the loveliness of its shameless honesty, the grinning candor of each human error.